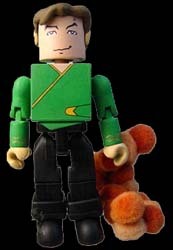 Captain Kirk "The Trouble With Tribbles"
Art Asylum's range of Mini Mate figures always remind me of oversized Lego men. They're figures that you will totally fall in love with, or immediately hate. Personally, I fall into the latter category. To me, these little figures are cute, simple collectable items that can be enjoyed by both children and serious collectors alike. Well constructed and beautifully detailed, these make an ideal present for that Star Trek fan who has everything. And, as this model is a limited edition item, it's very unlikely that they will already own this already.